Sold, page saved for info only! The design is aft cockpit with two stateroom layout. 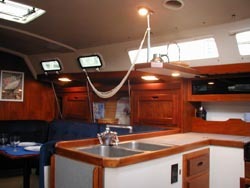 The interior of this vessel has 6'3" headroom, teak interior with a teak and holly sole. 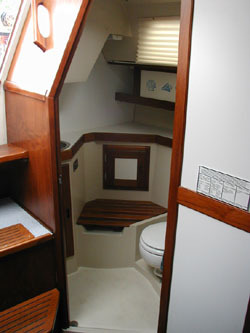 The forward stateroom has a huge V-berth, hanging locker and several drawers and lockers, some of which, are custom additions. 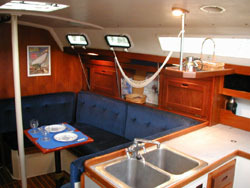 Aft to starboard is a large U-shaped dinette with a table in the center which raises or lowers to form a large double berth. 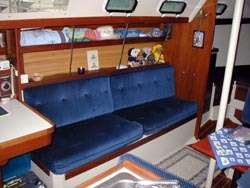 Directly across from that is a full length settee which converts to a single berth. 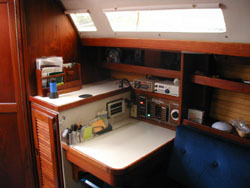 Aft to starboard is the large L shaped galley with chart table directly across, which uses the aft end of the port settee as a seat. 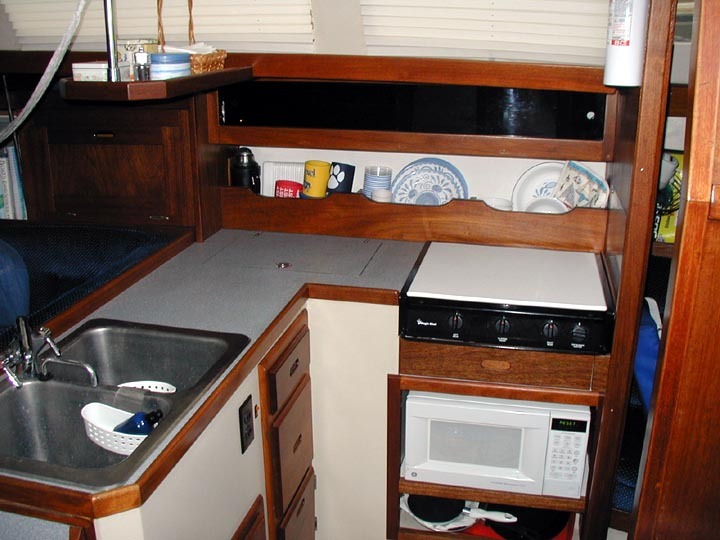 Directly behind that is a food storage locker, then a large head which houses, in addition to the commode and sink, a teak slat seat for sit down showering. Across from that and directly behind the galley is the fully enclosed aft double stateroom with a huge athwartships double berth. Teak and holly sole throughout. 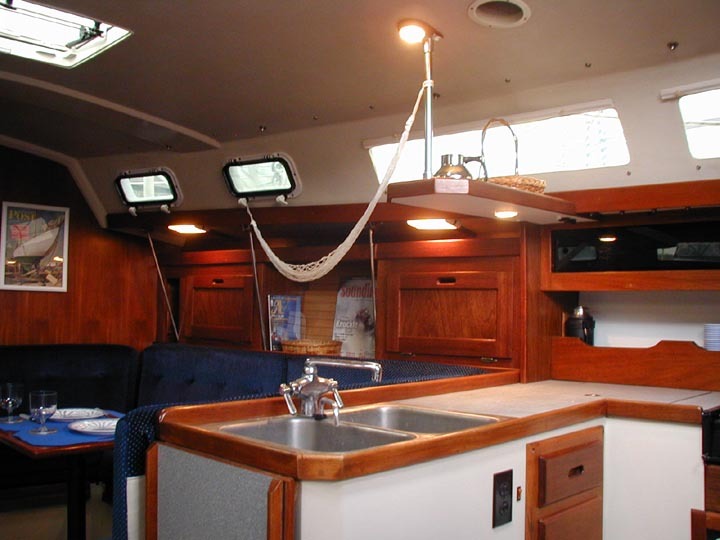 Ventilation & light is provided by three deck hatches, eight opening Beckson ports with screens, two dorade vents and two solar fans (1 in head, 1 in aft cabin). New counters, new propane stove with built-in microwave below. Large silverware draw also under stove. Shelf and lighting added above counter area. 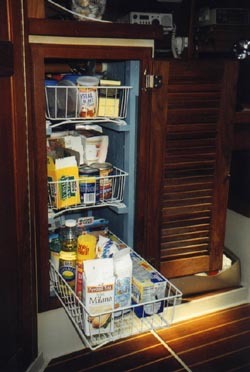 Large three shelf pantry. The hot water is supplied from a 6 gallon hot water heater heated either by the 110v electric service or the engine coolant. 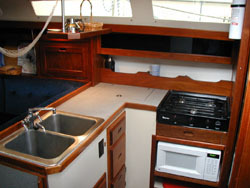 There is also good counter space for food preparation as well as lots of storage space for utensils and dry storage. 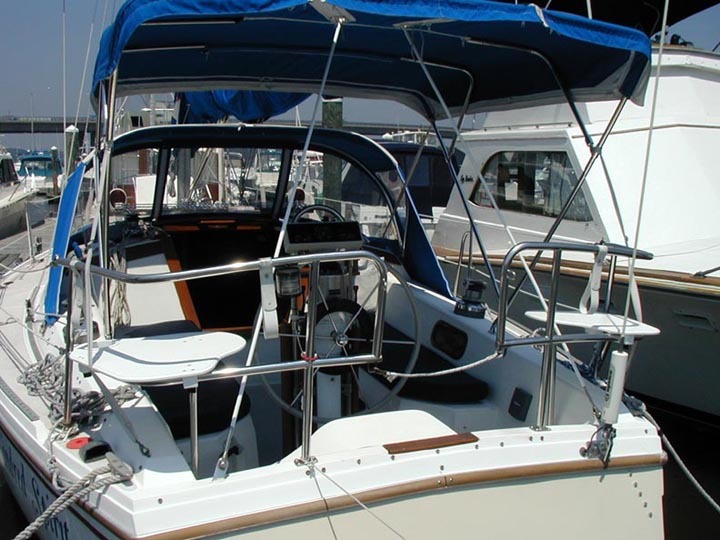 This boat has electrical equipment designed to provide enough power for extended cruising. 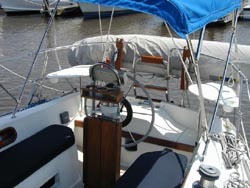 The 12 volt service is provided by two banks of batteries through a typical parallel switch. Bank #1 is comprised of 4 golf cart batteries providing 12v and 440 amp hours. Bank #2 contains a single 12v battery for engine starting, new in 2000. There is extra heavy 1/O wiring throughout the battery systems. 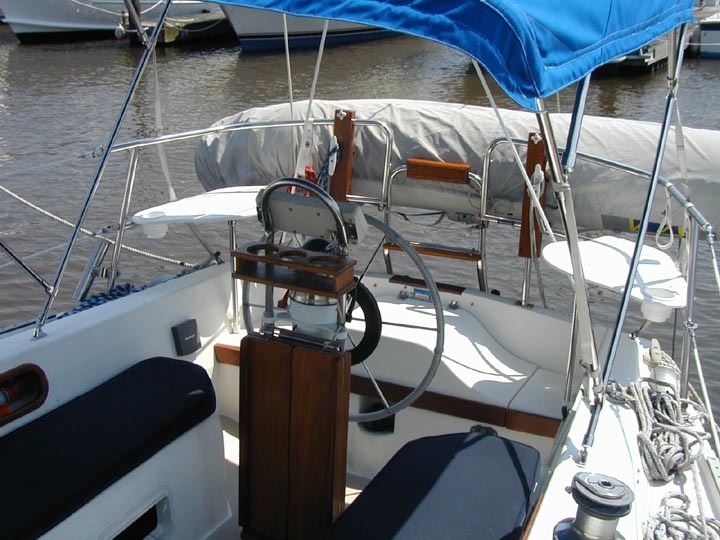 There is 110v AC power throughout supplied by shore power or through the Freedom 10 Inverter. 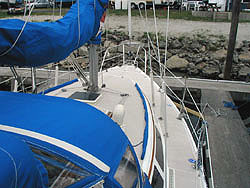 The aluminum mast is stepped on the deck supported by a steel column resting on the keel root. 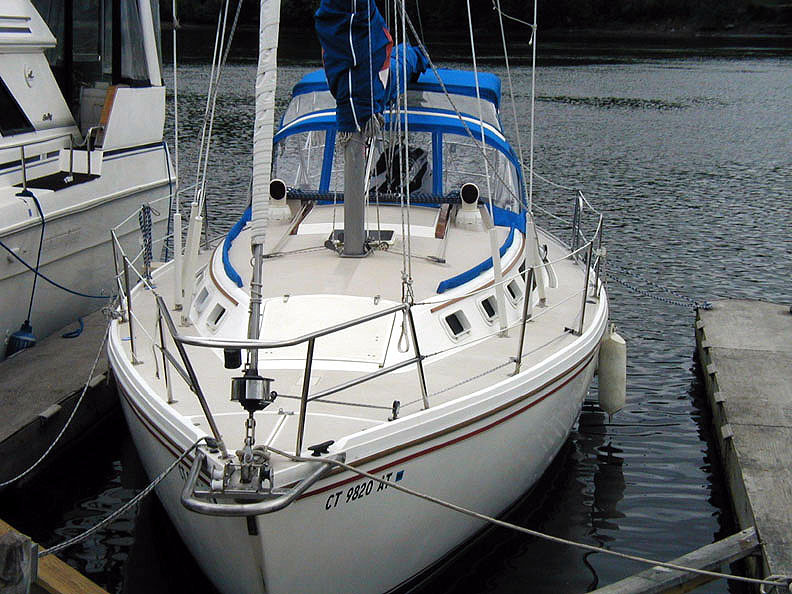 The genoa winches are Maxwell 46 two speed self tailers. 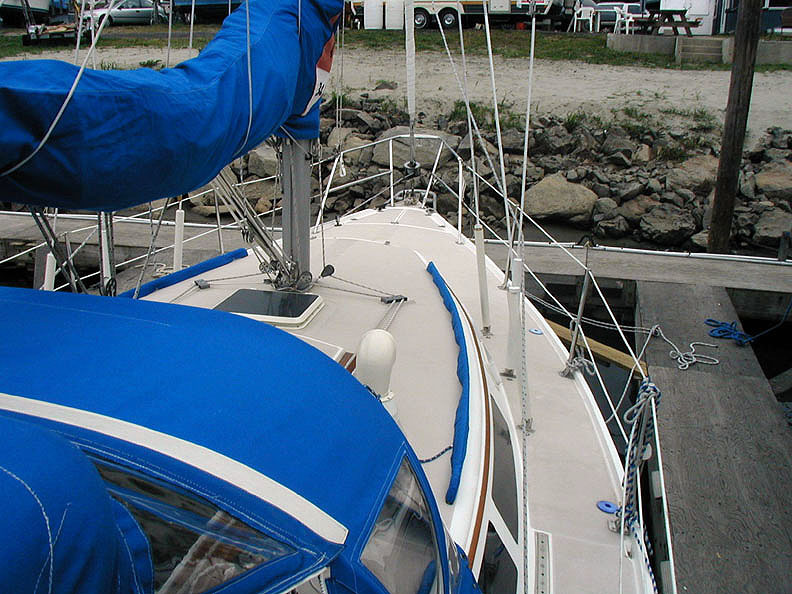 The main halyard winch on the starboard cabin top aft is a Maxwell 30, 2-speed self tailer, and the genoa halyard winch on the port cabin top aft is a Maxwell 30 2-speed only. Hull color is white. The deck is white and the non-skid is tan. The cove and boot stripes are Red/Blue, bottom is blue. 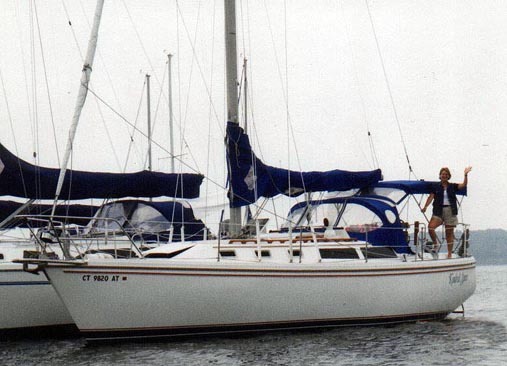 Two Anchors, a 33# Bruce on a large stainless custom bowsprit with 150' rode plus chain leader and a Danforth stored in locker. 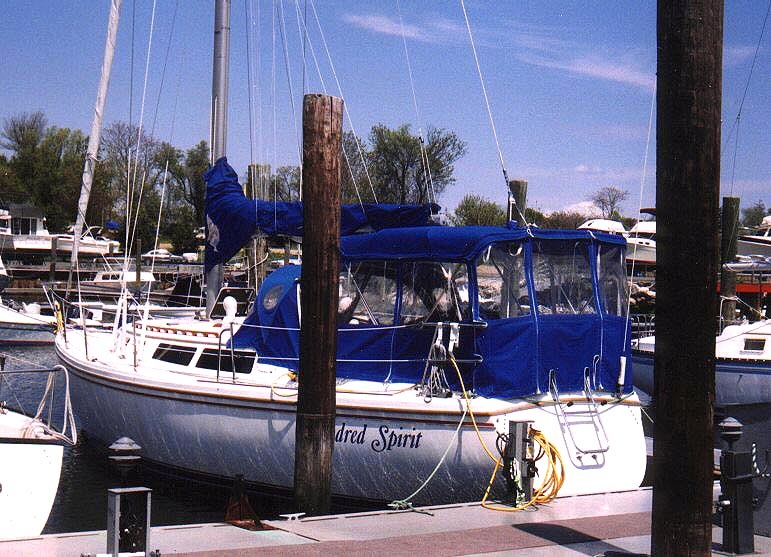 Stainless bow and stern pulpits with boarding ladder at rear. 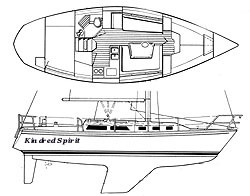 There are double rail bow and stern pulpits. The double lifelines were replaced new in 1998. 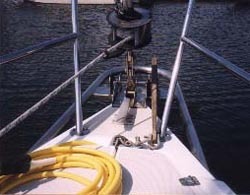 There is a swing-up swim ladder attached to the transom. There is a new (2000) Sunbrella dodger connected to a bimini with a filler windshield between and complete enclosing matching curtains. 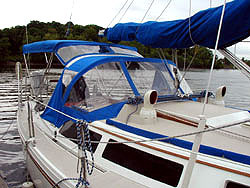 Boat has a full cockpit enclosure - dodger/bimini, side curtains, windshield with heavy-duty stainless steel framing to make an additional room to enjoy. 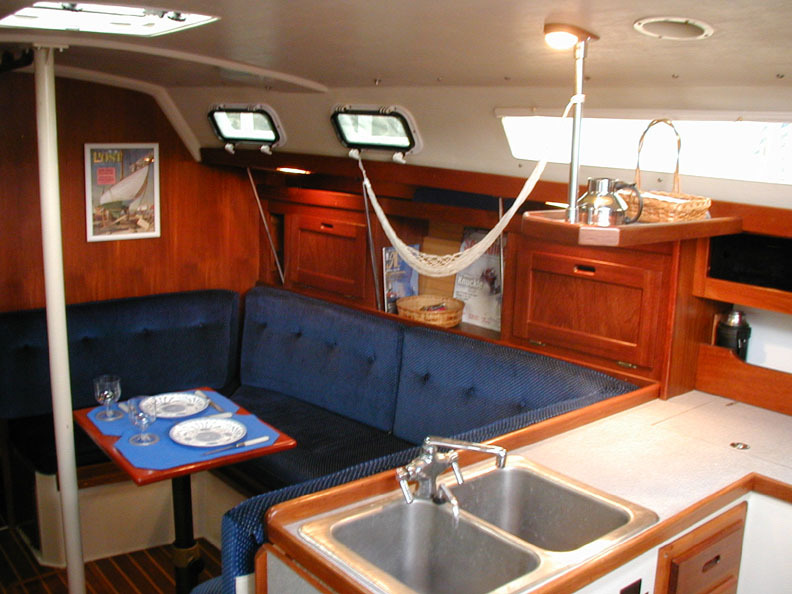 This boat also boasts a built-in microwave oven which can run off the house batteries through the inverter. There is also a fan in the aft cabin wired to the house service. 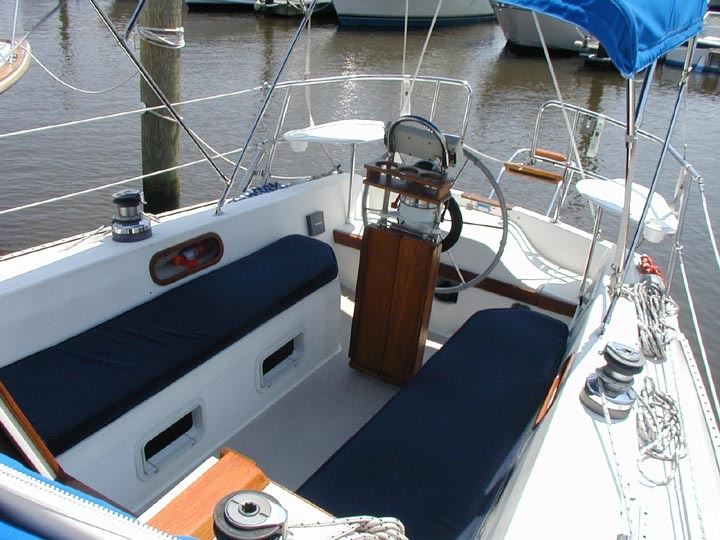 In addition to the original hatch boards, there are custom Starboard hatch boards for the companionway. There is also custom cabinets built throughout the boat to increase storage space. Bimini with full cockpit enclosure.